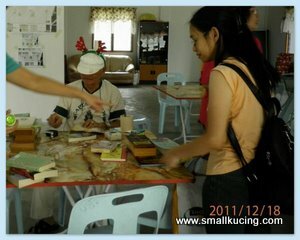 SMALL KUCING: Special Christmas Celebration at Subang Jaya Book Exchange Programme, Community Hall USJ2. 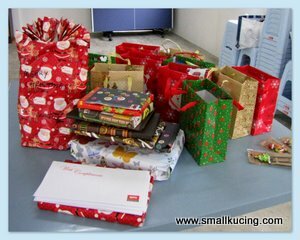 Special Christmas Celebration at Subang Jaya Book Exchange Programme, Community Hall USJ2. Last Sunday we attended the last book exchange of the year. This round, it's extra special. Those regulars contributed food. Some are store bought while some are home made. 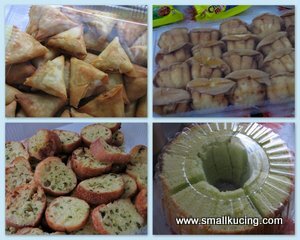 Cakes, cookies, bread, muffins, fruits and drinks ...all also got. These ginger bread man and Christmas Trees really made Mamarazzi feel like wanna dig a hole and hide. Why? Coz it was baked by a young boy. Aiyo...so young already know how to bake. A young chap some more leh. If ask Mamarazzi to bake sure it would end up in the bin. 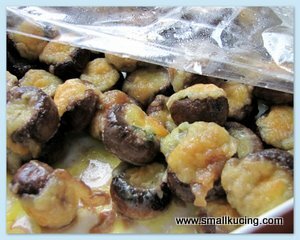 These mushroom are like Magic Mushroom. Kejap ada, kejap habis. Very delicious. Made using Jamie Oliver's recipe by one of the regulars. Even, Mamarazzi who doesn't like cheese ate 3-4 pieces of these. 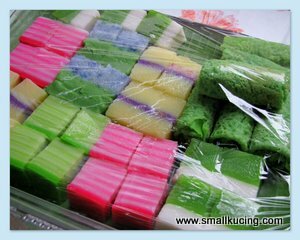 Of course, it's not makan-makan only. There must also be "food" for the bookworms. The book exchange was still ongoing. These are just some of the books. There are plenty more yet to be taken out. This photo is taken from SJBEP Facebook. Uncle James is busy sorting out the new books. Apart from the makan-makan, there was Story Time too. Uncle James recounted to us the lovely tale of Pinocchio. He tells it well. Very funny. Why am I smiling like a cat who had swallowed a canary? Coz of these! 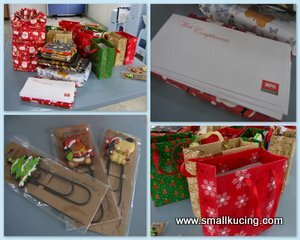 Goodies bags and gifts. 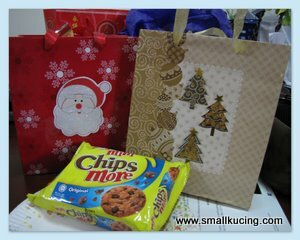 Goodies bags for the kids and gifts for the adults. The adults had Quiz and those who answered correctly would receive a gift...at least that was the plan. It didn't go as planned. Instead, everyone and anyone who knows the answer would just shout out the answer.It was really fun! Laughter everywhere! There was a Jie Jie who also answered a question for the adult though she was still a kid. Terror! So clever! Guess what...I got TWO goodies bags instead of one. Mamarazzi got two gifts and adopted a book home. Now, it's sitting under our Christmas Tree waiting for Boxing Day. Mamarazzi brought home these book. The books are a bit worn out but it was well loved. Everyone in the community respected books. Books are handled with care and much love. Damaged books are still loved and not destroyed. In fact, Mamarazzi overheard one of the regulars offered to bring a damaged book home to repair before returning it to the Exchange. Mamarazzi also brought home a book written by her friend, the late S.H. Tan. He was the inspiration for many aspiring journalist back then. 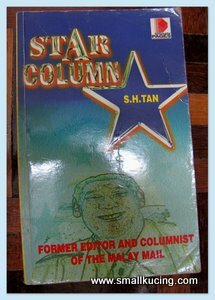 He encouraged many youngster to write through Malaysian Post back in the 90s. Anyone interested to go for the next book exchange? Am not sure next year what date will the book exchange be but do follow them at https://www.facebook.com/sjusjbep . 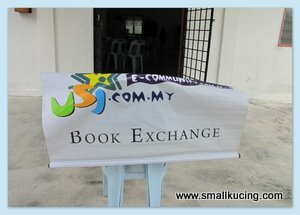 The Subang Jaya Book Exchange Programme is a community project by a group of residents from Subang Jaya & USJ for all book lovers and avid readers in our community. 1) Bring a book to donate. 2) Choose a book to bring home. You give, you take. Everyone reads! 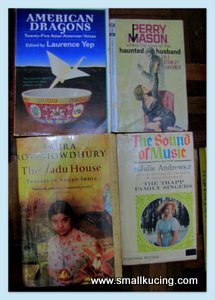 1) to exchange and share books we have read and thus, getting to know the people living in our own community. 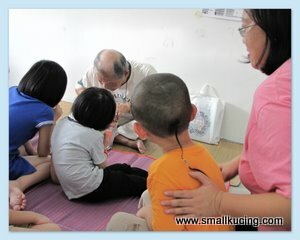 2) to promote the reading habit among the Subang Jaya folks, young and old. No need to be shy. Although it says among Subang Jaya and USJ folks, but avid readers from everywhere is welcomed. It's a very relaxed and charming community. Hope to see you there next year! I suppose to be there me already planned to bring food for mamarazzi :( but last minute cancel gosh i was so upset that day till now still never talk to my hun... ROFL. sorry mamarazzi hope next time u invite me again..
what is an award and tag free zone btw? I can see you all are in the spirit of Christmas.. Lots of gifts and i guess the kids will really them..
What fun to do a book exchange! I wish we did something like that around here - I'll have to look into it. Missed the event. It was already 8pm when we got home. We used to live in USJ2 for 8 long years, hope I can make a visit to the book exchange next year! Eh don't be like that la...kesian your hun...Later Mamarazzi feels guilty pulak. Award and Tag Free Zone means Mamarazzi not accepting any award or tags in this blog. Reason being is Mamarazzi not good at doing those Tag thingy and Award thingy. Usually the Award thingy required the blog owner to pass the Award to others. If Mamarazzi pass the award to one and don't pass to another, nanti others will be offended pulak. Hence, Mamarazzi declared this an Award and Tag Free Zone lo. Mamarazzi is very excited to find this community. People who love books with a passion and very friendly too. This is such a clever idea in getting to read more books and everyone benefits from it. I'll have to set up something like this in Klang too. Interesting event!!! 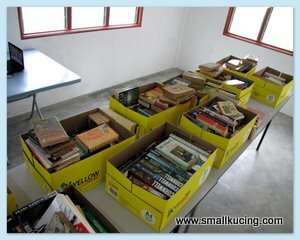 Good for those with old books that still in good condition and exchange with other books. Yummy mushroom there! 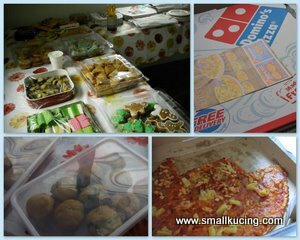 Its nice to see everyone coming here and having a good time with all the goodies available. 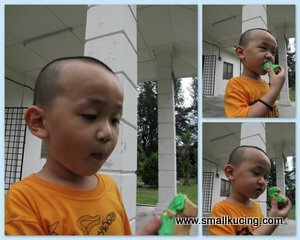 Yes, the cookies made from the young chap really looks good and thumbs up to him. the idea of book exchange is so good! merry christmas to you in advance! 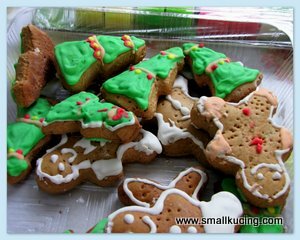 X'Mas is the season when everyone will be enjoying, your cookies looks tempting. 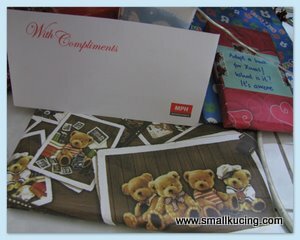 :) ANd those gifts! What a nice event. :) Thanks for sharing. So nice got food and pressies too. Yup...when you are back in Msia next year, do come and join la.